Perfect weather conditions, a fast route and a deep field resulted in a plethora of records tumbling at the 2ndannual FNB Durban 10K CITYSURFRUN on Sunday, 14 October 2018. Kenya’s Moses Koech rounded out the top three finishing in 27:46. In 6thplace, Stephen Mokoka, despite running a Marathon three weeks ago, was again the best South African, clocking 28:18. New kid on the block, 20-year-old Ryan Mphahlele smashed his personal best of 30:31 to finish in 28:46. “Over 6500 runners and walkers gathered at the FNB Durban 10K CITYSURFRUN to run their city their way. This year we are celebrating 180 years of existence at FNB – the race epitomizes the journey we’ve had over the years. This is not just any other race but a community event that enables people from all over the world to experience this beautiful City. 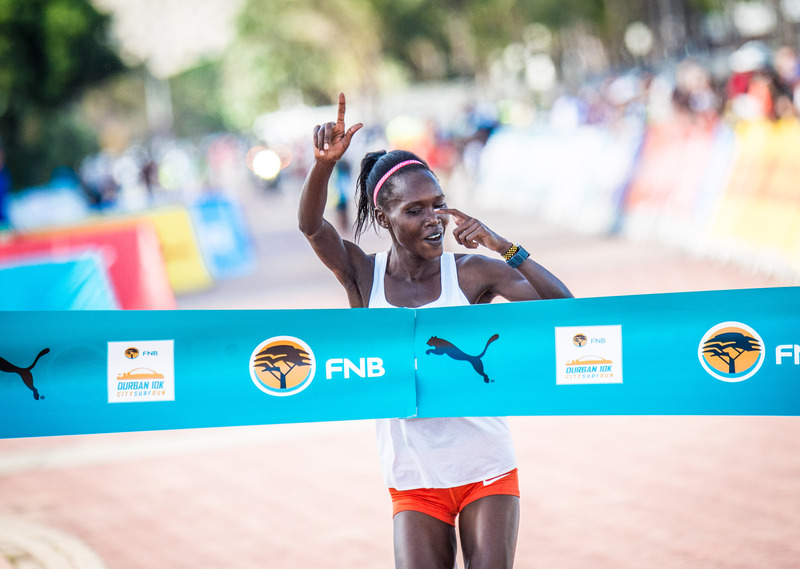 Congratulations to all the athletes for their competitive spirits and a very special congratulations to the winners, Joshua Cheptegei and Stella Chesang, for the sterling resultsand to the 25 runners who competed in all three events in the FNB RUN YOUR CITY SERIES in 2018,” says Michael Honeywell from FNB Business in KZN. Celebrating its 2ndanniversary in 2018, the FNB Durban 10K CITYSURFRUN granted entrants the unique opportunity to explore their city on foot. In addition to lively on-route entertainment and rubbing shoulders with some of the world’s best middle distance runners, the 2018 FNB Durban 10K CITYSURFRUN route also highlighted a number of Durban’s iconic landmarks. CHARITY SUPPORT: When entering online runners (and walkers) could support one of five Durban based charities: 1. The Reach For A Dream Foundation, 2. TREE, 3. Durban & Coast SPCA, 4. LIV Villageand/or 5. iThemba Lethu. EXCITING ON ROUTE ACTIVATION: PUMA South Africa threw down the gauntlet challenging runners to ‘Beat Bolt’ at the 2ndannual FNB Durban 10KCITYSURFRUN. The ‘Beat Bolt’ Sprint required speed. Runners were encouraged to give their all over a 100m sprint. This section of the route was timed. The runner (male and female) to clock the fastest time over the 100m was rewarded with a PUMA shopping voucher to the value of R10 000.